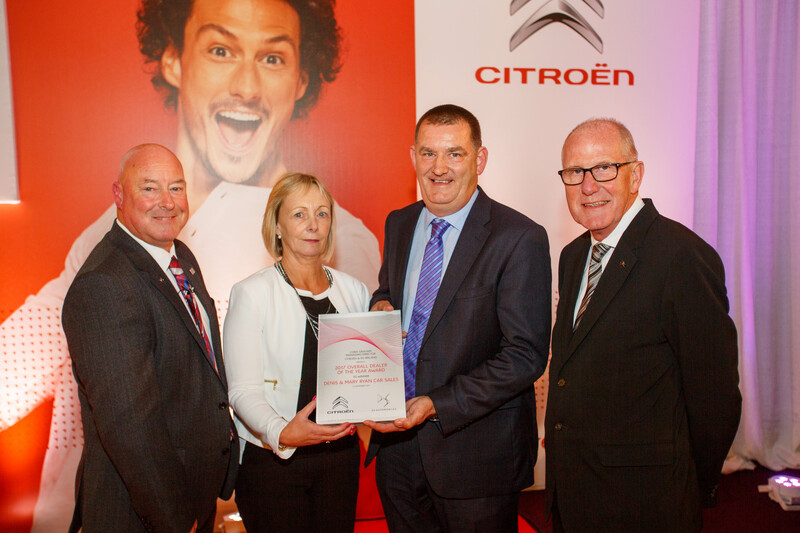 Denis & Mary Ryan Car Sales, Bishopstown, Co. Cork, has been awarded the Citroën & DS Automobiles Dealer of the Year Award 2017, from a network of 19 authorised sales dealerships nationwide. Denis and Mary Ryan were officially presented with the award by Chris Graham, Managing Director, Citroën & DS Ireland at the 2017 Dealer Conference which took place at the Mullingar Park Hotel in September. Pictured at the presentation is: Chris Graham, Managing Director, Citroën & DS Ireland, Denis and Mary Ryan, Dealer Principals of Denis & Mary Ryan Car Sales and Paul Tunnicliffe, Managing Director of International Motors Limited (IML), UK & Ireland. Originally appointed to the Citroën Network in 1991; Denis & Mary Ryan Car Sales are the longest serving Citroën dealership in Ireland. As proud sponsor of Schull and Goleen Social Centres, and of the Fastnet Film Festival ; the dealership places a strong value on supporting the local community. At Denis & Mary Ryan’s the team strive to provide the highest standards of service to ensure their customers have a positive sales and service experience. Long term employee, and resident Consultant Technician Derry Collins, epitomises the dealership’s excellent approach to customer care. Denis and Mary have built the dealership over 25 years, and with their son Donnacha now working with them the future of this family business is very strong.